Last edited by UnlikeUday on Wed Apr 04, 2018 3:31 pm, edited 1 time in total. Lets hope Bottas can do better in qualifying this time than in Australia. He was on pole last year. That may build his confidence up a little. - New engine regulations from 2021 with the initial blueprint featuring cars powered by a V6 turbo hybrid engine, without an MGU-H, a more powerful MGU-K.
- A standard ruling towards more standard parts that will have limited areas of development. - The current Concorde Agreement expires in 2020 meaning the next binding contract between Formula One Management, the FIA, and all the teams is set to be decided for the 2021 season onwards. How the F1 revenue is distributed may also be overhauled & Ferrari would be keeping a close eye on this. Jep, it's not a specseries but that would be the first step toward one. From all various things I have seen F1 is going to be Americanised. Depends what they make standard for me. I could live with spec front wings and floor on the chassis side and spec batteries and energy stores on the 'K' side of a new engine that got rid of the 'H'. I wouldn't fuss if they went full hog and made the 'K' entirely spec as well. Leaving suspension,sidepods,engine cover,rear wing and nose for chassis makers. And leaving the rest of the engine for the EM's. Free up a bit in the combustion process, allow another injector maybe, in a V6 twin turbo. Increase fuel flow and maybe some other things can be done to mix it up. No historical payments and fairer distribution of funds. 50% split evenly and 50% split up by finishing order. I wouldn't even mind if they spec'd the suspension as well, cheap full active suspension for everyone rather than spend millions developing hydraulic suspensions that mimic the same job poorly. 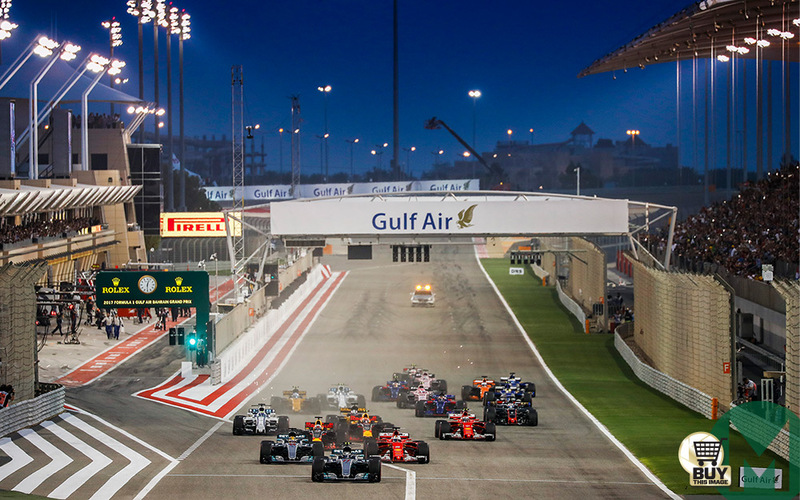 Bahrain does complement overtaking. It's a more traditional track when compared to Melbourne's street track. i think pirelli should be forced to bring either hyper or ultras to every race. even though this will at least be a 2 stopper, probably, why have they become so conservative? have they completely forgot canada 2010 and the fact they were originally asked to make tyres which degrade. might as well have bridgestones. so what if they turn up here with hyper ultra and super (or soft) and everyone is struggling to make them last. it will make it interesting. oh yeah thats right. as with everything else in formula 1 they have decided they now want something different ie tyres which they can push on for a full stint (bridgestones) apart from all the fuel saving! another couple of years of these and im sure everyone will be saying we need more degradation blah blah. along with 2009 type reg changes to get rid of all the unnecessary crap off the cars. clowns. As expected, drivers will use the Medium tyres only in free practice. 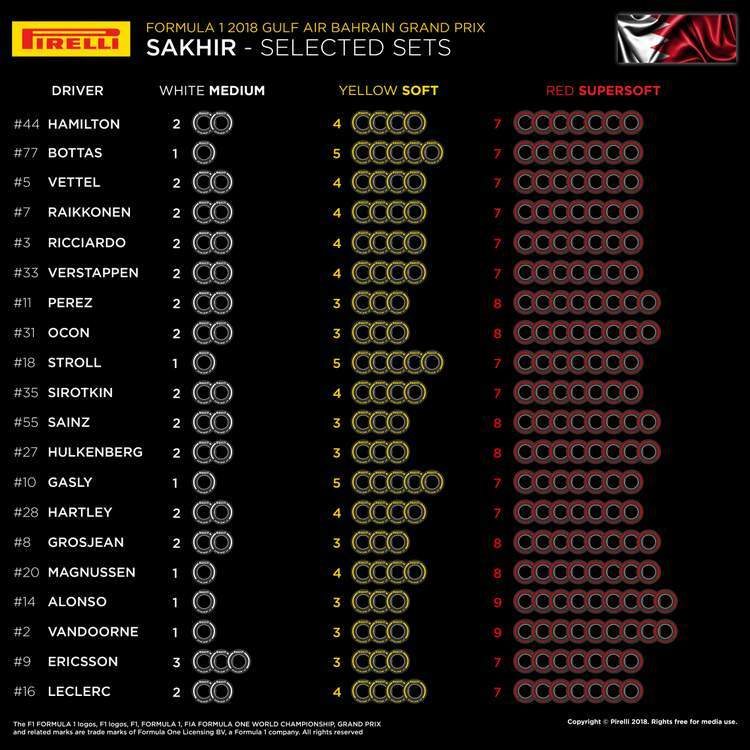 So then only 2 tyre compounds what drivers will look at for tyre strategies. I feel medium onwards towards the hardest compound should be eliminated altogether. Keep only softs & lower if FIA wants more pit stops. I don't see the point of mediums or hards either. Scrap them and keep the fastest 4. Just my 2 cents. I think it was 2004 when ITV's coverage opened with the words "Rain in Bahrain?" amid a light shower. Course, by the time the cars went out it was bone dry. Verstappen available at 11/1 for the race win, seems a good bet to me. 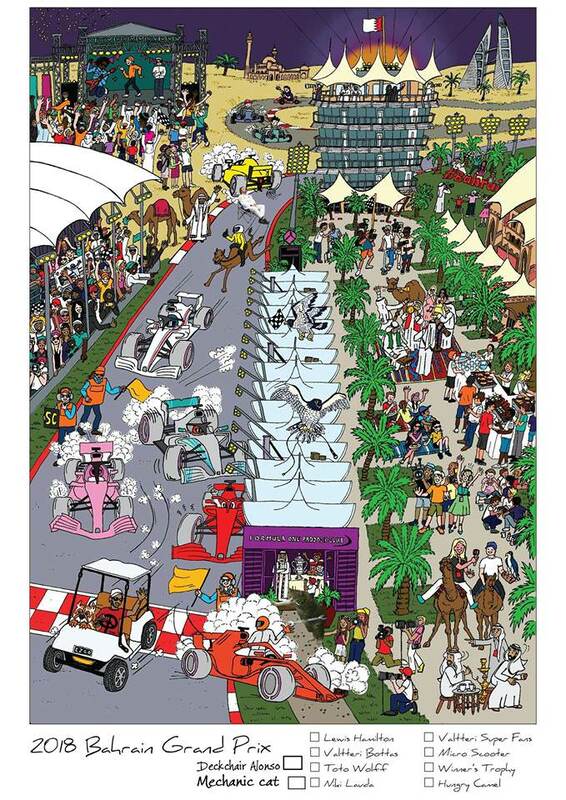 This should be a good race, provided its not a 1 stopper, surely Bahrain can’t be a 1 stopper. Well done liberty media on delaying every single race by 70 minutes this year and absolutely demolishing your own live viewer figures in Asia... But hey, at least Asia isn't the single largest market in the world, nor the one that has the highest growth potential that would attract the most advertising revenue. 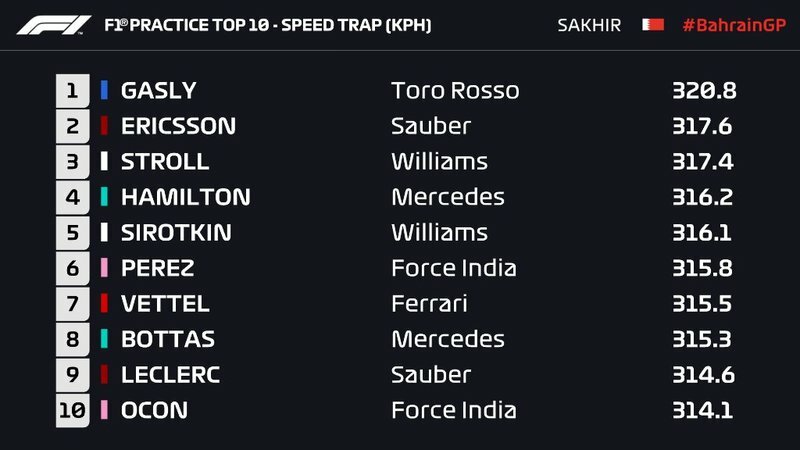 Verstappen already having turbo issues. Does anyone else find the radio graphic mildly annoying? It's the bars that move completely out of sync with voices. It is like a PS1 graphic. I have an irrational annoyance about it. This grid start after a SC is complete none sense. What a terrible rule. This will guarantee to make 2-3 race wins per season pure luck as well as multiple positions not for the win completely randomised. A driver can, top every practice session, every Q session, lead every lap and dominate the entire weekend and then have a SC drop in the last 10 laps and get out dragged into turn 1. At some tracks its actually an advantage to start in P2, like Russia. Especially with these huge and wide draggy cars from 2017 on wards. Not to mention that a restart late in the race will mean a massive difference between the clean and dirty sides of the track with all the marbles that accumulate over the race. Yes, as well as drivers not pushing there tyres at all - just in case a SC comes out and they have to do a restart. A restart on worn tyres (according to Grosjean) makes you very vulnerable and you get an awful get away. So just another reason for the drivers not too push during a race. Excitement in a sport is important, but if it comes at the expense of proper competition and a level playing field then it might as well be WWE. I was especially shocked how Paul di Resta seemed not to care at all about this issue when talking about SC restarts at the end of that session. 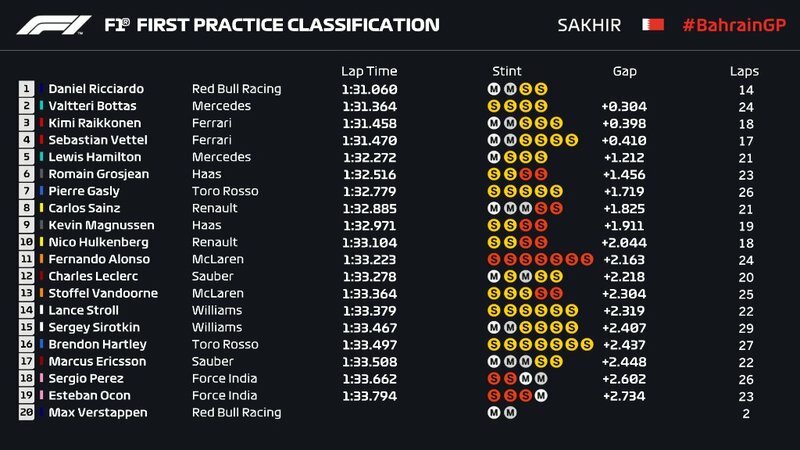 So Alonso was more than 2s slower than Ricciardo. I'm hoping they haven't put the much-vaunted upgrades on yet! He did afaik. Stoff doesn't. Just a new bargeboard on the side of the sidepod though so far. They're obviously still struggling to get them out. Plus the new nose doesn't come until Spain so there could be some concerns they wont get as much out of the upgrades until the new nose comes. Supposed to be more in China next week to. I thought the standing start restarts were just after red flags, if not why didn't they do a standing start restart in Australia? Now they are saying electronics issues. I hope it's not a turbo this early in the year. Max is already down on points. If he is soon way out of the points, it will only exacerbate his all or nothing attitude and we will see him trying more and more low percentage moves. Diresta and Crofty said they were running a practise run of forming up on the grid after the session with the view of introducing it after SC's. They just want to make the racing as much as a lottery as they can, sad. Both Macca's have the upgrade now apparently. FP1 was just a comparison check. KMag still likes to be a roadblock it seems.